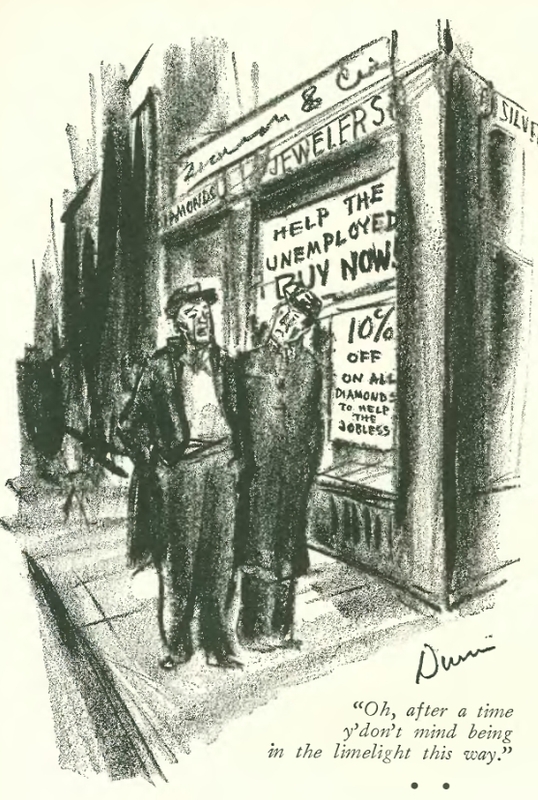 Having -- like most of the rest of the country -- concluded that the newly-born depression was no big deal, The New Yorker, managed to virtually ignore it until November 1930. Then, suddenly, the paper was FULL of depression references...to apple sellers. Cartoons. Comments. Little snipes in otherwise unrelated articles. I don't know if the apple seller scheme -- the International Apple Shippers Association sold apples to the unemployed at a loss, putting an "apples for the unemployed" vendor on virtually every New York street corner -- actually worked, but it certainly seemed to put a visible face on the worsening depression, and it also annoyed a lot of pedestrians in the city. Those with jobs, anyway. Another source of depression news in the paper were the ever-present full-page advertisements for the Evening Standard, which basically said "These troubles will be over soon, and the only firms which will survive are the ones which continue to advertise!" The Evening Standard was truly making lemonade in response to the lemons...or at least grinning while eating the lemons raw. I have become an apple-scorner. I know. It will not earn me wings. Distribute, say, light wines and beer?